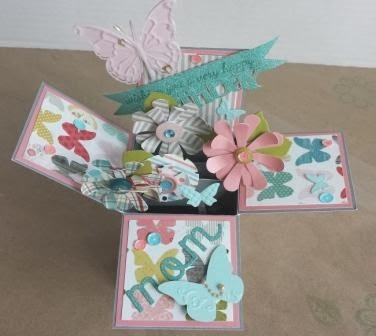 I have been making the box cards that you see on Pinterest! I have fallen in love with them. They come in all shapes and sizes and can be as creative as you wish!! 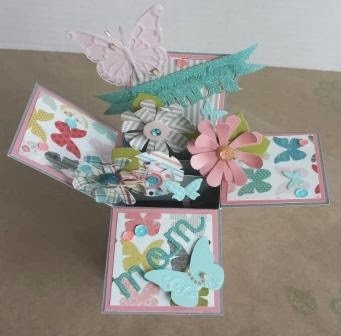 This card was made for a friend's mother . I adore these colors and I love this paper from My Mind's Eye! Once you've made one of these box cards, you are pretty hooked. Then it all folds down nicely and fits in an envelope that I made especially for this card! This box is larger that the others I have made and therefore, I had to make an envelope out of 12x12 paper. This picture shows the colors more. Love these spring colors! Some items used are from Stampin Up. The butterfly in the back is from Memory Box. Thanks for stopping by! Hope Spring comes our way soon! Please join my blog if you are visiting for the first time! Have a great week!! Oh, this is so fabulous & lovely!